Sure, it may not be sweater weather just yet, but scoring a new pair of shoes is the easiest, most fun, most weather-appropriate way to get started on a new season. And there’s no doubt about it: this fall promises to be a sparkly one. Glittery embellished pieces are everywhere — and that very much includes styles of the footwear variety. 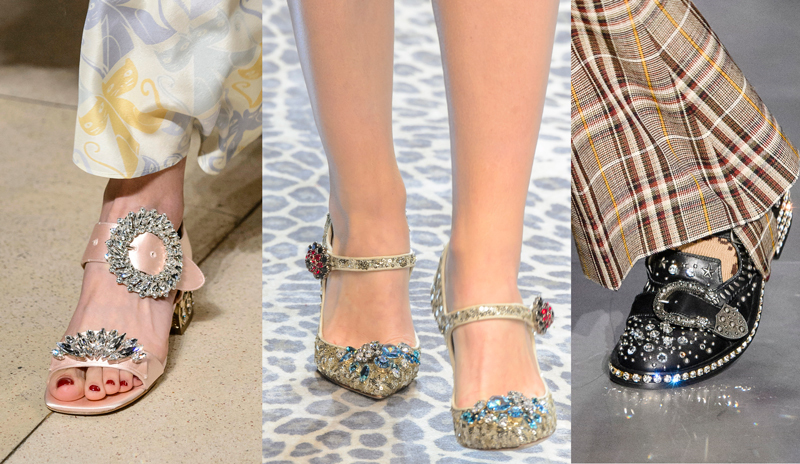 Yep, it’s time to bust out a pair of bejeweled evening shoes, because who wants to save their prettiest pairs for weddings and holidays anyway? The fall runways were packed with fancy feet with everything from flats to OTK boots on offer in glitzy iterations. (Who needs jewelry?) Miu Miu included crystal brooch adornments and buckle closures on traditional fare, like satin styles, as well as on more out-there options like furry sandals and suede riding boots because, presumably, everything is better with bling. Never one to shy away from the ornate, opulent thing, Dolce & Gabbana‘s shoe showing was filled with sequins, pearls, rhinestones and more. Gucci also sent down one bedazzled beauty after the next, including items like crystal T-straps and Western-inspired loafers, each paired with embellished tights. It was a footwear feast for the eyes. The street style set was quick to pick up on the adornment trend, naturally. Mega stars like Kate Foley were almost instantly spotted in sparkly statement shoes. Bejeweled flats, pumps and sandals were quickly everywhere, paired with drapey skirts, dresses and rolled denim. And just like that, daytime became as good a time as any to break out your party shoes — let the celebration begin! If all this talk of daytime glam has you ready to shop the trend, we’ve put together a best-in-class evening shoes shopping list for fall in the slideshow ahead. Whether you favor a mule, strappy sandal, ankle boot or all of the above, there’s something here to strike your footwear fancy. Shine on, you crazy diamond rhinestone.